Ireland's 2014 player of the year Andrew Trimble has been left out of their 31-man squad for the World Cup. The 30-year-old winger missed this year's Six Nations because of a toe injury but returned to action in last month's victory over Wales in Cardiff. Seven of his Ulster team-mates are named, including centre Darren Cave. Leinster prop Tadhg Furlong is selected after making his debut against Wales, while Cian Healy is chosen despite not having played in the warm-up fixtures. 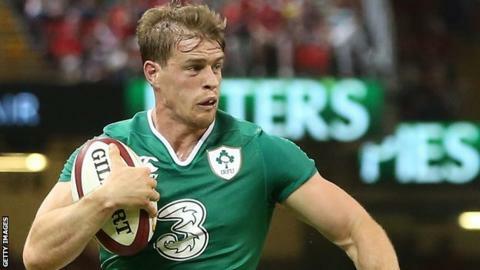 Trimble's appearance in the 35-21 victory over Wales on 8 August was his first for Ireland since June 2014, but a recurrence of his toe injury meant he managed only 33 minutes. Veteran centre Gordon D'Arcy also misses out and with the 35-year-old having announced he will retire at the end of the World Cup, he may well have already played the last game of his career. Healy had neck surgery in May and the Ireland management appear to have gambled on the loose-head recovering match fitness in the coming weeks. The inclusion of tight-head Furlong, 22, means there is no place for Michael Bent, who can play in both prop positions. Munster's Dave Kilcoyne misses out as Jack McGrath is selected as the other loose-head, in addition to Healy. Leinster front-rower Marty Moore has not made the squad as he continues his recovery from a foot injury. The remainder of the forward division is as expected, with Ulster lock Dan Tuohy and Leinster back-rower Jack Conan omitted. Coach Joe Schmidt has opted to name just two scrum-halves in Conor Murray and Eoin Reddan, with first-choice fly-half Johnny Sexton backed up by Paddy Jackson and Ian Madigan. That means Leinster pivot Isaac Boss and Connacht counterpart Kieran Marmion miss out. The seven Ulster players in the squad are forwards Rory Best, Chris Henry and Iain Henderson and backs Tommy Bowe, Jared Payne, Cave and Jackson. Wingers Keith Earls and Luke Fitzgerald, who were injured during Saturday's defeat by Wales in Dublin, are included. Simon Zebo, Earls, Fitzgerald and Payne all provide full-back cover for first-choice number 15 Rob Kearney. Munster's Felix Jones, Leinster's Fergus McFadden and Ulster's Craig Gilroy also miss out. Hookers: Rory Best (Ulster), Sean Cronin (Leinster), Richardt Strauss (Leinster); Props: Tadhg Furlong (Leinster), Cian Healy (Leinster), Jack McGrath (Leinster), Mike Ross (Leinster), Nathan White (Connacht). Locks: Iain Henderson (Ulster), Paul O'Connell (capt), Donnacha Ryan (Munster), Devin Toner (Leinster). Back-rowers: Jamie Heaslip (Leinster), Chris Henry (Ulster), Jordi Murphy (Leinster), Sean O'Brien (Leinster), Peter O'Mahony (Munster). Back three: Tommy Bowe (Ulster), Keith Earls (Munster), Dave Kearney (Leinster), Rob Kearney (Leinster), Simon Zebo (Munster). Centres: Darren Cave (Ulster), Luke Fitzgerald (Leinster), Robbie Henshaw (Connacht), Jared Payne (Ulster); Fly-halves: Paddy Jackson (Ulster), Ian Madigan (Leinster), Jonathan Sexton (Leinster); Scrum-halves: Conor Murray (Munster), Eoin Reddan (Leinster).